TIKA HAS JOINED THE PARTY. I’m looking forward to where this character goes. She should be a lot of fun. The idea for this comic actually came from me deciding that we should probably show where Locke and Ence have been travelling to this whole time. This entry was posted on Friday, December 10th, 2010 at 12:00 am and is filed under Comics. You can follow any responses to this entry through the RSS 2.0 feed. Both comments and pings are currently closed. Is it a reference to this at all? 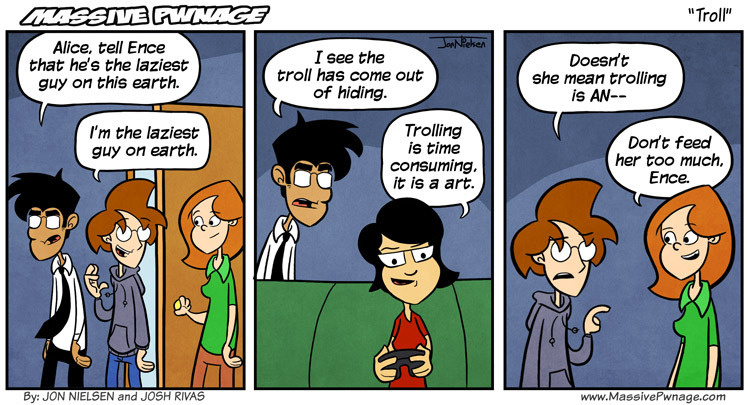 Read all the comics after discovering this site……..
New character FTW! I don’t really like trolls, but I do it sometimes through Omegle or Chatroulette. Sometimes I”ll go on Solo 5v5 on League of Legends,just to troll the,as Locke so eloquently put it,”Noob-tubing,spawn camping,1337ers”.One time I acted all polite and completely reasonable,and it was the best thing ever because that was the best way to troll this person.One time a Blitzcrank started trying to just rush in and attack the Nexus on his own.Repeatadly.I genuinely think he was eight.Another time I met a troll on the opposite team,and we friended eachother. Has Locke said that? League of Legends needs more try-hard people that are actually trying to play the game and win, and less trolls that are just there to ruin it for everybody.